Please inform Apartments Kasalo in advance of your expected arrival time. You can use the Special Requests box when booking, or contact the property directly with the contact details provided in your confirmation. Apartmani Orlic ~0.1 km, Trogir price per day from € 49 Providing a private pool, the air-cooled Apartments Orlic enjoy a privileged position above the harbour, 5 minutes' walk from Trogir's centre and 200 metres from the beach. Free internet access and free car parking are available. 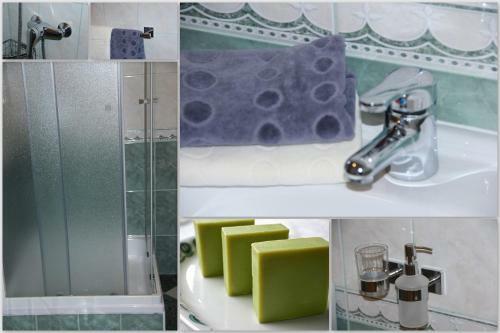 All rooms have an outdoors terrace, a private toilet and come fitted with a flat-screen satellite television. Various eating places and a supermarket can be found in the immediate proximity of Orlic Apartments. In addition to standard morning meal fare, the property also provides a gluten-free option. You can make free use of the back yard with grill amenities and a playground. Apartments Kasalo ~0.1 km, Trogir price per day from € 59 Please inform Apartments Kasalo in advance of your expected arrival time. You can use the Special Requests box when booking, or contact the property directly with the contact details provided in your confirmation. Fresh apartments Dar Orlic ~0.1 km, Trogir Fresh Apartments Dar Orlic is just 200 metres from the breathtaking Old City of Trogir and the sea. It presents a seasonal swimming pool and an outdoors terrace with breathtaking views over the town and harbour. All apartments are air-cooled with satellite television and free internet access. A seating area and a full-size kitchen with dining area are included for your comfort. Some apartments enjoy sea views from their private terraces. 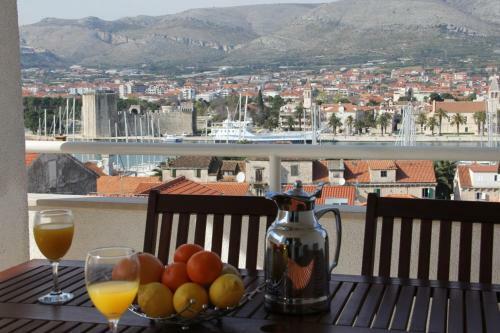 Visitors of the Fresh Apartments enjoy easy access to all that Trogir has to offer; shops and clubs, pavement coffee shops and eating places as well as all local facilities are available within 200 metres. Okrug Gornji ( ~ 2.9 km ): 785+ apartments. Beach Pantan, Trogir ~ 0,4 km from Apartments Kasalo Sandy beach: ideal for families, with caffe bar, equipped with showers. Beach Medena, Seget Donji ~ 2,5 km from Apartments Kasalo Gravel beach: ideal for families, recommended for young people, with restaurant, with caffe bar. Excellent choice of watersports. Beach Mavarstica, Okrug Gornji ~ 2,8 km from Apartments Kasalo Sandy beach: ideal for families, recommended for young people. Beach Okrug Gornji, Ciovo ~ 3,3 km from Apartments Kasalo Sandy beach: ideal for families, recommended for young people, with restaurant, with caffe bar, equipped with showers. Excellent choice of watersports. Beach Kava, Slatine ~ 10,2 km from Apartments Kasalo Gravel beach: ideal for families, with restaurant, with caffe bar. Restaurant Sv Dominik, Trogir Guest reviews: 9,2/10 ~ 2,9 km from Apartments Kasalo Address: Blazenog Augustina Kazotica 1, 21220, Trogir. Cuisine: Croatian cuisine. Restaurant Mediteraneo, Trogir Guest reviews: 8,5/10 ~ 0,4 km from Apartments Kasalo Address: Ulica Kralja Tomislava 70, Trogir. Cuisine: Croatian cuisine. Restaurant Kristian Pizza, Trogir Guest reviews: 9,1/10 ~ 2,8 km from Apartments Kasalo Address: Bl. Augustina Kazotica 6a, Trogir. Cuisine: Pizza. Restaurant Piccolo Ponte, Trogir Guest reviews: 10/10 ~ 2,4 km from Apartments Kasalo Address: Vukovarska 9, 21220, Trogir. Cuisine: Pizza & Pasta, Grill. Restaurant Kamerlengo, Trogir Guest reviews: 7,6/10 ~ 2,4 km from Apartments Kasalo Address: Vukovarska 2, 21220, Trogir. Prices: 6 HRK - 6 HRK. Cuisine: Croatian cuisine.